One of my very favorite werewolf movies is now available for the first time on Blu-ray! When the day comes that I'm found dead somewhere and my legacy is being discussed by literally no one, I hope it's said that one of the few positive things I did during my time on Earth was to champion 1985's Silver Bullet, the Daniel Attias-directed adaptation of the Stephen King novella Cycle of the Werewolf. It's a movie I've been talking up for years all over the site. Back in 2015, I wrote a "Movies I Love" piece on it. Last year, I recorded a podcast on it as part of our crossover event with Blake Fichera, host of the Saturday Night Movie Sleepovers and Scored to Death podcasts. I just recorded another podcast about it when I guested on our friend Margo Donohue's podcast Book vs. Movie. It has long been a favorite of mine, so having a platform to sing its praises was not an opportunity I intended to squander. 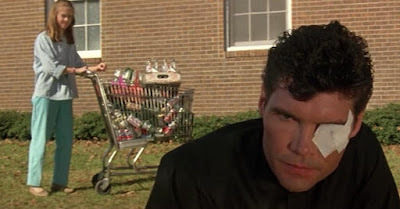 Through no doing of my own, it appears that much of the horror community has caught up to Silver Bullet, too. Once dismissed as just another forgettable Stephen King adaptation from the mid-'80s, the film has now been welcomed as for the special movie it is. Bad werewolf aside, there's just something about the characters, the warmth, the nostalgia of Silver Bullet that sets it apart not just from other King adaptations, but even more so from the other werewolf movies of the 1980s. In a decade that produced both An American Werewolf in London and The Howling (and in the same year, no less! ), I'd give Silver Bullet the #3 spot just behind those two. That's not a bad place to be. If I'm being honest with myself, I'm more likely to rewatch Silver Bullet than either of those movies, even if it doesn't share the same classic status. 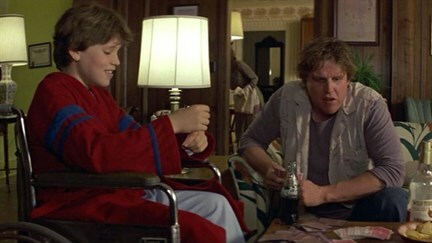 I've always described Silver Bullet as To Kill a Mockingbird meets a monster movie, which is precisely why I love it. The horror aspects are fun, which cool gory kills and angry mobs attacked in the fog-covered woods, but what puts the movie over the top for me is its naked sentimentality: the way that the characters relate to one another, the use of corny voiceover, the syrupy sweetness of Jay Chattaway's score. As proof of the film's rightly improved reputation, it has finally received a Blu-ray release courtesy of the Australian label Umbrella Entertainment. The region-free (!!) release presents the movie in a 1080p widescreen transfer with a host of new special features, including a full commentary by director Daniel Attias (who only directed this one film, but now has become one of the biggest TV directors working and has been on every single show you watch or like). The rest of the bonus features are new interviews with producer Martha De Laurentis, wife of producer Dino De Laurentis, star Everett McGill, and effects artists Matthew Mungle and Michael McKracken, Jr. The three interviews and Attias's commentary do a good job painting a picture of how the film came together, all with an undercurrent of tension about the controversial werewolf costume that undermines the movie. The finished design drove a wedge between De Laurentis and his friend Carlo Rambaldi, tasked with creating the werewolf and delivering something...less than satisfactory. I appreciate that a number of the special features on the Umbrella disc acknowledge this issue with the movie and attempt to shine a light on how it happened. I'm so happy to finally have a Blu-ray of one of my favorite horror movies, and especially one that helps fill in the gaps about a production that hasn't been covered as much as a lot of other horror films. I've had questions for years about Silver Bullet, and this disc finally answers a bunch of them. It's nice to be able to retire my old DVD for a copy that looks and sounds better, too. 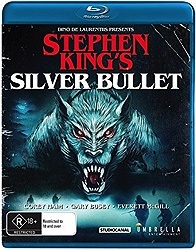 Mostly, though, I'm just happy that this release gives me another chance to watch and talk about Silver Bullet again. It really is special. Only mildly related: has FTM ever covered Monte Hellman’s Iguana? Everett McGill is never not interesting.